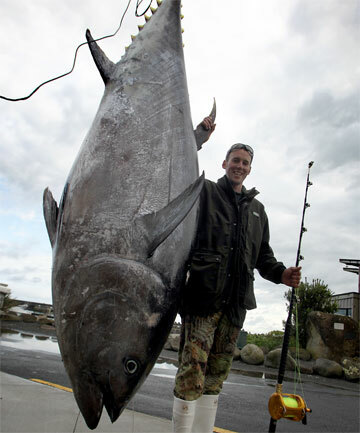 Fisherman Jeremy Walker caught a 671 lb Pacific Bluefin Tuna off the coast of Westport in the South Island of New Zealand last month. It took Jeremy only one hour and 50 minutes to reel the fish in on his Okuma Makaira composite rod with 132 lb line and circle hooks. Every man aboard was needed to help hoist the tuna on deck at 2am on a Sunday. Fishing skipper on the trip, David Donald estimated the monster would be worth US $80,000 in Tokyo fish markets. Although population of the fish have declined in recent years and the species is considered endangered by a host of environmental groups, Mr Donald said fishing of Bluefin tuna is “pretty well controlled in New Zealand”. “It’s the overseas trawlers out with longlines and 20,000 hooks, just out of our waters that are doing the damage,” he said. Earlier this year, a 752 lb bluefin tuna sold for a record US $396,000 on the Japanese market. However, this tuna has no plans to be sliced and served up in Japanese’s top restaurants. Jeremy has other plans. Upon returning to shore, on the back of a Rutherford’s Meat Processing truck, the giant tuna was divided into large triangular chunks and dispersed amongst Jeremy and the 4 other fisherman on the trip. Donald explained..
There’s plenty of meat on one to slab up into steaks to put on the barbecue. What are your thoughts on Jeremy’s decision to eat the fish instead of sell it? We want to hear from you! Pity it wasn’t released, but as long as someone eats it that’s fine by me. Fully agree with Jeremy that the damage is done to the stocks by commercials, sports anglers catching one or two are not going to exterminate the population.